Doug Markgraf’s cross country fundraising and awareness bike ride will end in Toms River August 21. 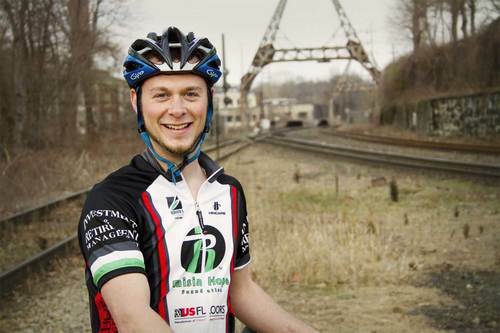 The finish line is in sight for Doug Markgraf, a traumatic brain injury (TBI) survivor who is due arrive in Toms River August 21 after cycling across the country alone to raise money and awareness for TBI. Markgraf chose the location to highlight the work of Health South Rehabilitation Hospital of Toms River. “We’re hoping to connect Doug with our brain injury survivors and our therapy team,” she said. Markgraf, of Philadelphia, has been meeting with TBI survivors throughout the trip and was five miles outside Smyrna, Ohio when Patch talked to him Thursday afternoon. “It’s blown me away that people who need that extra boost are getting it by me riding and meeting them,” said Markgraf. Read the whole inspirational story at Toms River Patch.